One of the secrets to great looking skin is a great looking diet filled with organic protein, fruits, and vegetables for the vitamins, minerals, and antioxidants, or what enthusiasts call holistic nutrition. When you eat processed foods filled with refined sugars and unnatural chemicals (like food coloring, preservatives, or artificial sweeteners), the body struggles to remove these toxins. 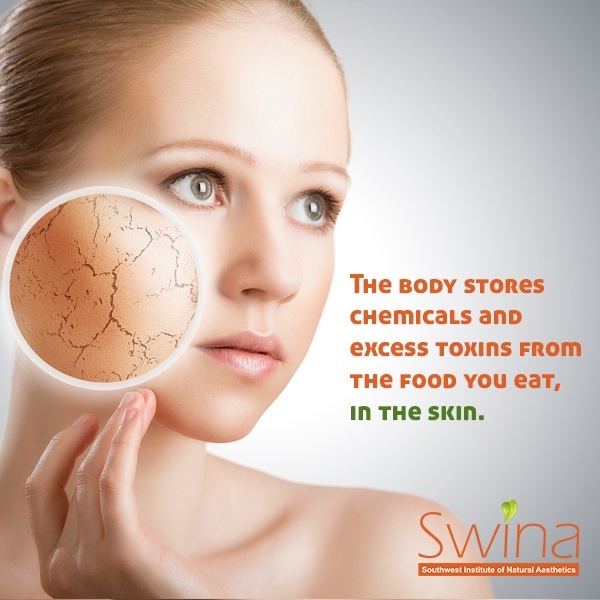 Guess where the body stores the excess waste: the skin! Wrinkles are generally a result of a lack of moisture in the skin, which the body also struggles to produce on its own because of the natural aging process. 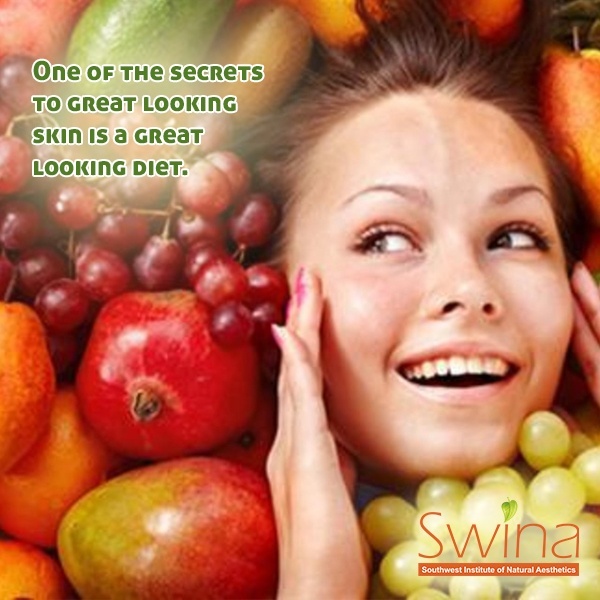 A healthy, holistic diet provides the essential nutrients that support healthy skin moisture and structure. 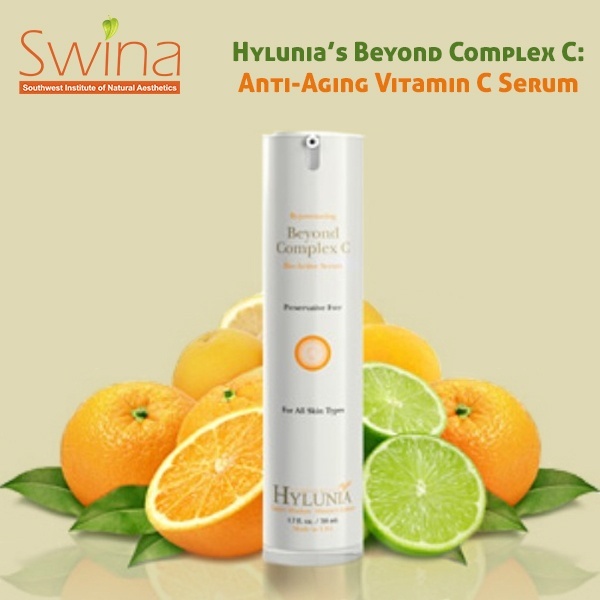 Hylunia, one of Southwestern Institute of Natural Aesthetics’ favorite skin care product lines, makes a wonderful, anti-aging, vitamin C topical serum called, Beyond Complex C, which nourishes and protects the skin while aiding in natural moisture production, increasing the skin’s brightness, vitality, and smoothness. If you wanted to go the extra mile, take a daily anti-aging supplement to help reduce the storage of disease-causing toxins and support cellular regrowth for younger looking skin. Be successful at implementing better habits and keeping them by clicking the link below and checking out our other blog on our SWIHA site! Professionals in nutrition across the globe would agree that limiting bad (saturated) fats, incorporating more fruit and vegetables, and eating a diet that limits sugar, is fundamental to our well-being. However, holistic nutritionists would also strongly advocate for balance and moderation of potentially fattening food, rather than complete food restriction because we all know what happens when we say, “No, you can’t have any ____.” The time spent on the diet will be cut short. Like quitting a bad habit, good habits will also take time to instill, so be gentle and patient with yourself and others. For more support and encouragement, Life Coaches or Nutrition Coaches are available to guide you and cheer you towards your goals. It is a better choice to ask for help than give up because you feel like you failed or aren’t strong enough to meet your mark. Many of SWIHA’s Great Graduates have Life Coaching certifications and are currently serving the community. You may find a coach in your area by reading our blogs with the tag Life Coaching. It may seem impossible at first, but changing your diet is possible. If you’re the type who resists change, it might be easier if you change one thing at a time. You might have to get creative so your food has flavor and it’s enjoyable to you. The effort you put in will make the transition smoother. Here are some ideas to get you going. A Mediterranean diet, which includes fish or chicken olive oil, fruit, and tomatoes, is not only heart-healthy, but supports healthy skin. The omega-3 fatty acids in the fish will help keep skin-cell membranes strong and elastic, while the olive oil and tomatoes have high antioxidant levels which assist in preventing chemical reactions in the skin that lead to sun damage. Chicken is high in magnesium, an essential electrolyte for maintaining the skin’s hydration. Found in B vitamin complexes, choline aids in the production of collagen and will also fight against free radicals. Grill 6-12 chicken breasts and let cool. (The steam will turn to ice and make the chicken soggy if you do not let cool completely.) Salt and pepper alone is delicious; for more flavor, use worcestershire or squeeze lemon on as they cool. Individually place them in a baggie and store in a large bag in the freezer. Take one out as you need. The same exact thing could be done with fish of your choice. (Salmon, mahi mahi, ahi tuna (moderately), snapper, halibut, sea bass, shrimp, or tilapia are some good options.) Omega-3’s are fatty acids that are known to be anti-inflammatory and are crucial for sufferers of dermatitis, rosacea, psoriasis, or chronic acne. Additionally, omega-3’s have demonstrated a resistance to UV radiation which may even reduce the risk of skin cancer. Turkey is high in biotin (B vitamin-good for moisture retention), zinc (for inflammation caused by blemishes), and selenium (neutralizes free radicals before they can lead to wrinkles), all of which maintain healthy skin. A pound of ground turkey or beef (buy 93%-7% Fat) can be made into taco meat, using sautéed onion, garlic, and your favorite spices. Add the taco meet to organic greens with salsa and no dressing is necessary. Cocoa hydrates your skin, making it firmer and more supple, for that natural glow! Dark chocolate or cacao are your best bets, over milk chocolate (high in fat and sugar). Cacao contains flavanol which has been noted to have positive effects on facial wrinkles and elasticity. Plain Greek yogurt is loaded with protein, moderately low in carbs, and low sugar. (Avoid the flavored options and can also be used as a sour cream substitute.) Dairy helps the skin become firmer, so it resists lines and wrinkles. Walnuts contain omega-3’s and are loaded with copper. As previously stated, omega-3’s improve skin elasticity and copper boosts collagen production. Add to the Greek yogurt with your favorite berry for a super-skin breakfast or snack. Sunflower seeds are also high in omega-3 and a sunflower seed oil can hydrate lips and heels when topically applied. Fight crow’s feet with bell peppers. Carotenoids, the antioxidant found in yellow and orange vegetables, can decrease the skin’s sensitivity to sun, as well as fight the smiling creases around the eye. When making positive changes in life, we all have to start somewhere! Don’t compare yourself to the Jones’ or to your favorite pop star on TV. You are you and you have the ability to accomplish anything. With the internet at your fingertips, you can look up recipes that suit your needs as well as your palate. Don’t forget to keep foods you love in your weekly routine, just monitor your servings. If you can’t give up chocolate, don’t: eat a couple Hershey’s Kisses or a small handful of chocolate chips; not half the bag. Can’t give up your favorite muffin at the coffee shop? Don’t. Eat half and save the other for the next day. If you love happy hour with your friends, try a light beer instead of the IPA or a glass of red wine. Learn to reward yourself in other ways, like buying a new shirt on sale, a manicure, or a new yoga studio you wanted to try. When you’re constantly adding new things to your life, you won’t feel so badly for giving up the foods you love. As always, be kind to yourself, and it’s ok if you slip and eat five slices of pizza after a bad day. It’s not the end of the world. You just get back on track the next day! Also, before making any major changes, you might want to discuss your thoughts with your healthcare profession.